"Ostehøvelen er en norsk oppfinnelse." 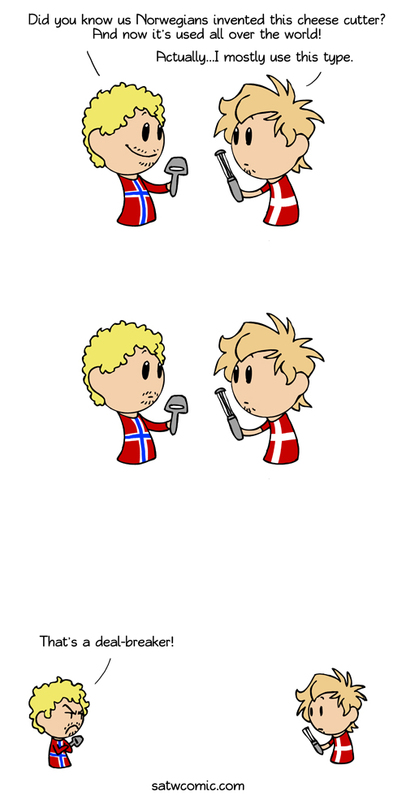 Translation:The cheese slicer is a Norwegian invention. This is exactly the first thing that came to mind when I read this sentence! Fortell det til det nederlandske folket! Haha don't tell the Dutch. Endless debate about who invented it. Personally I'm more interested in who invented television or the internet..
Svenskene burde legge til denne frasen i det svenske kurset! I had tried to write mente!!! Translation: "The Swedes should add this phrase to the Swedish course!" No, in English you would call it a cheese slicer. We do indeed call the equivalent tool in woodworking a plane, but it doesn't translate to kitchen tools! Actually I call it a "cheese slice", by analogy with cake slice (which doesn't mean a slice of cake but something used for slicing and serving it).